BLOOMINGTON – At least they were there. And that’s the whole point, isn’t it? High school track athletes work an entire season to qualify for the IHSAA state finals. And Warsaw’s girls got it done. The fact they came away from Friday’s state meet with no awards doesn’t diminish the original accomplishment. “We just came down with the mentality that we were going to give our best, and we were just going to give 110 percent, no matter what our time was or what the conditions were,” said Angie Sanchez-Vijil, the leadoff leg on Warsaw’s 4 x 400 relay, following the girls state finals Friday in Bloomington. “Honestly, I cannot be more proud of the girls I ran with,” she said. Hamilton Southeastern turned back Indianapolis Brebeuf, 62-44, to win its first girls state title at the Indiana University track in Bloomington. One new state record was set – Lake Central’s Destiny Washington won the 100-meter high hurdles in 13.93 seconds. Strangely, it was a rough meet for athletes who qualified from the Kokomo regional – the regional Warsaw came through. Only one earned a state title. Kokomo’s Tionna Brown won the 200-meter dash. The top nine finishers in each event earned IHSAA award medals. Warsaw got close several times, but never quite close enough. Mia Beckham, a senior, finished 12th in the 1600-meter run, clocking 5:08.70. She closed out her Tiger career with a 22nd place finish in the 3200, recording 11:08.51. Emma Bohnenkamper, also a senior, had a rough day in the 1600, placing 27th. Her 5:35 clocking was well off her best. High jumper Lexie Day cleared 5-4, but needed to go at least an inch higher to reach the awards stand, She finished 14th. The Tiger 4 x 800 relay was 22nd, as Carmen Yoder, Ashlynn Hepler, Adree Beckham and Remi Beckham finished in 9:49.51. Makayla Clampitt, a junior, clocked 12.59 in her trial heat of the 100-meter dash, missing the finals by 26-100ths of a second. She finished 22nd in the field. The Tigers’ other sprinter, Abbi Curtis, ran 26.17 in her trial heat of the 200 and placed 23rd overall. Warsaw’s 4 x 400 relay — Sanchez-Vijil, Adree Beckham, Maygan Bellamy and Remi Beckham – closed out the meet with an 18th place finish, clocking 4:02.70. A thunderstorm swept through Bloomington midway through the finals, forcing an approximate 1-1/4 hour delay. The extra rest helped some athletes, but mostly made everybody more anxious. NorthWood’s Erica Stutsman was involved in the wildest race of the meet, the 800-meter run, where results were reviewed for over an hour before they were finalized. She finished 12th in 2:18.11. Surprisingly, only one Northern Lakes Conference athlete came away with an IHSAA medal. Goshen’s Jillian Kissinger finished sixth in the 300-meter hurdles, clocking 44.85. Lexie Day was 14th in the high jump for Warsaw. TEAM SCORES (Top 20): Hamilton Southeastern 62, Indianapolis Brebeuf 44, Warren Central 40, Carmel 38, Perry Meridian 32, West Lafayette 27, Indianapolis North Central 26, Valparaiso 21, Lawrence Central 19, South Adams 19, Kokomo 18, Greencastle 16, Indianapolis Bishop Chatard 15, Zionsville 15, Noblesville 15, Brownsburg 15, Carroll (Fort Wayne) 14, Fort Wayne Northrop 14, Lawrence North 14, Cedar Grove 14, Lake Central 12 … South Bend Adams 6 … Penn 5 … LaPorte 4 … Goshen 4 … South Bend Washington 2 … Culver Academies 1. 4 x 800 relay: 1, West Lafayette (Emma Tate, Ellie Tate, Mary Schulz, Itoro Udo-Imeh) 9:11.21. 2, Brownsburg 9:11.64. 3, Indianapolis Brebeuf 9:15.77. 4, Lawrence North 9:16.26. 5, Carmel 9:16.44. 6, Noblesville 9:19.93. 7, Franklin Central 9:21.79. 8, Penn 9:22.42. 9, Evansville Reitz 9:25.48. … 22, Warsaw (Carmen Yoder, Ashlynn Hepler, Andree Beckham, Remi Beckham) 9:49.51. 100 hurdles: 1, Destiny Washington (Lake Central) 13.93 (STATE RECORD). 2, Nakita Turner-Lee (Brebeuf) 13.98. 3, De’Aira Robertson (Lawrence Central) 14.14. 4, Joselyn Mwenifumbo (South Bend Adams) 14.41. 5, Mia Mackenzie (Hamilton Southeastern) 14.45. 6, Addie Wanner (South Adams) 14.60. 7, Dylan Kirkwood (Fort Wayne Northrop) 14.64. 8, Alyssa Tincher (Logansport) 14.76. 9, Faith Jackson (Hammond Bishop Noll) 15.07. TRIALS: 16, Rylin Bagarus (Mishawaka) 15.46. 100: 1, Semira Killebrew (Indianapolis Brebeuf) 11.55. 2, Tionna Brown (Kokomo) 11.75. 3, Camille Christopher (Hamilton SE) 11.81. 4, Kiyah Yeast (Center Grove) 11.90. 5, Mikeisha Covington (Warren Central) 12.05. 6, Tionne Brigham (Evansville Bosse) 12.13. 7, Jessica Palmer (Bowman Academy) 12.17. 8, Tamia Perryman (Fishers) 12.22. 9, Kelani Benson (Lake Central) 12.33. TRIALS: 13, Paishence Johnson (Mishawaka) 12.35 … 22, Makayla Clampitt (Warsaw) 12.59 … 24, Oniste Thomas (Concord) 12.79. 1600: 1, Phoebe Bates (Carmel) 4:51.79. 2, Ava Gilliana (Valparaiso) 4:52.54. 3, Sophia Rigg (Zionsville) 4:52.80. 4, Emma Wilson (Greencastle) 4:57.14. 5, Margo Hornocker (Oak Hill) 4:57.49. 6, Maddie Dalton (Carmel) 4:59.63. 7, Katherine Modrall (Brebeuf) 5:05.01. 8, Brenner Hanna (Greensburg) 5:05.57. 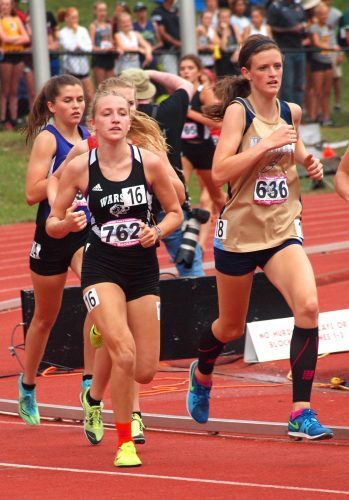 9, Abi Little (Noblesville) 5:05.94 … 10, Morgan Dyer (Elkhart Memorial) 5:06.98 … 12, Mia Beckham (Warsaw) 5:08.70 … 27, Emma Bohnenkamper (Warsaw) 5:35.35. 4 x 100 relay: 1, Indianapolis Brebeuf (Nakita Turner-Lee, Hanna Hearn, Brooklyn Chestnut, Semira Killebrew) 46.87. 2, Hamilton Southeastern 47.25. 3, Indianapolis North Central 47.41. 4, Fishers 47.73. 5, Bowman Academy 48.05. 6, Center Grove 48.20. 7, Ben Davis 48.83. 8, Merrillville 48.86. 9, Carmel 48.87 … 18, Concord (Oniste Thomas, Janiyla Holloway, Jasmine Riffell, Jasmine Hudson) 49.73 … 19, Mishawaka Marian (Carlondrea Petty, Kassady Chudzicki, Lindsey Matthew, Chloe Lentych) 50.09 … 23, Mishawaka (India Jones, DeiJana Smith, Claire Shide, Daijza Robinson) 52.15. 400: 1, Mikeisha Covington (Warren Central) 54.74. 2, Iyanla Hunter (Perry Meridian) 55.79. 3, Lauren Thomas (West Lafayette) 56.46. 4, Hannah Bargue (Perry Meridian) 56.98. 5, Reagan Hune (Carmel) 57.00. 6, Cierra Williams (Warren Central) 57.15. 7, Jemmia Pennnix (Penn) 57.22. 8, Aleka Ernsberger (Westview) 57.23. 9, Kennedy Barlow (Lawrence North) 57.49 … 18, Jasmine Hudson (Concord) 58.72 … 19, Erin Anderson (Culver Academies) 58.75. 300 hurdles: 1, Beth Barnes (Chatard) 43.76. 2, De’Aira Robertson (Lawrence Central) 43.81. 3, Patience Sakeuh (Pendleton Heights) 44.23. 4, Payton Waling (Tri-West Hendricks) 44.23. 5, Isabella Jackson (Whiteland) 44.81. 6, Jillian Kissinger (Goshen) 44.85. 7, Mia McKenzie (Hamilton SE) 44.88. 8, Hannah Rapp (Yorktown) 44.98. 9, Dylan Kirkwood (Fort Wayne Northrop) 45.09 … 15, Joselyn Mwenifumbo (South Bend Adams) 45.79 … 24, Cecilia Delinski (John Glenn) 48.04. 800: 1, Maddie Russin (Crown Point) 2:12.35. 2, Elizabeth Stanhope (Pike) 2:12.40. 3, Abigail Lynch (Brownsburg) 2:13.01. 4, Julia Dvorak (Homestead) 2:13.69. 5, Jenna Barker (Seton Catholic) 2:13.73. 6, Katerina Shuble (LaPorte) 2:13.94. 7, Catherine Cavinder (Kankakee Valley) 2:14.07. 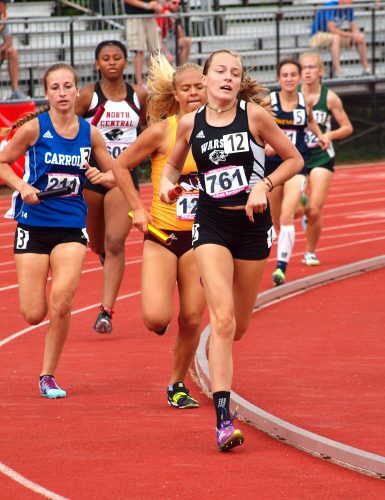 8, Abbey Brennan (Fort Wayne Concordia) 2:15.08. 9, Marissa Rivera (Culver Academies) 2:15.64 … 12, Erica Stutsman (NorthWood) 2:18.11 … 18, Nicole Marshall (Penn) 2:21.43. 200: 1, Tionna Brown (Kokomo) 23.86. 2, Camille Christopher (Hamilton SE) 24.19. 3, Mikeisha Covington (Warren Central) 24.24. 4, Semira Killebrew (Brebeuf) 24.26. 5, Skylynn Blue (Indianapolis North Central) 24.64. 6, Kiyah Yeast (Center Grove) 24.93. 7, Alyssa-Simone Robinson (Indianapolis North Central) 25.06. 8, Aa’leiah Winford (Jeffersonville) 25.12. 9, Tamia Perryman (Fishers) 25.35. TRIALS: 23, Abbigail Curtis (Warsaw) 26.17 … Paishence Johnson DNS (injured). 3200: 1, Emma Wilson (Greencastle) 10:27.83. 2, Meagan Hathaway (Carroll-FW) 10:39.24. 3, Tyler Schwartz (DeKalb) 10:41.06. 4, Abby Green (Carroll-FW) 10:43.51. 5, Phoebe Bates (Carmel) 10:44.77. 6, Jordyn Boyer (Lowell) 10:45.61. 7, Annalyssa Crain (Edgewood) 10:46.93. 8, Lulu Black (Hamilton SE) 10:47.67. 9, Shelby Bullock (Chesterton) 10:52.21 … 22, Mia Beckham (Warsaw) 11:08.51 … 25, Morgan Dyer (Elkhart Memorial) 11:17.67 … 27, Kelsey Tyler (Rochester) 11:40.70. 4 x 400 relay: 1, Hamilton Southeastern (Olivia Burgess, Mya Hammons, Annice McFarland, Tierra Sydnor) 3:51.10. 2, Perry Meridian 3:51.14. 3, Lawrence North 3:51.38. 4, Indianapolis North Central 3:53.40. 5, Indianapolis Bishop Chatard 3:54.16. 6, Warren Central 3:54.38. 7, Merrillville 3:55.24. 8, Carmel 3:55.64. 9, West Lafayette 3:57.01 …. 18, Warsaw (Angie Sanchez-Vijil, Adree Beckham, Maygan Bellamy, Remi Beckham) 4:02.70 … 24, Penn (Breana Enyeart, Nicole Marshall, Kelsi Carrico, Jemmia Pennix) 4:08.35 … 27, Northridge (Ariana Stoltzfus, Madison Sorg, Leah Stacker, Shelby Heerschop) 4:08.76 (dropped baton). 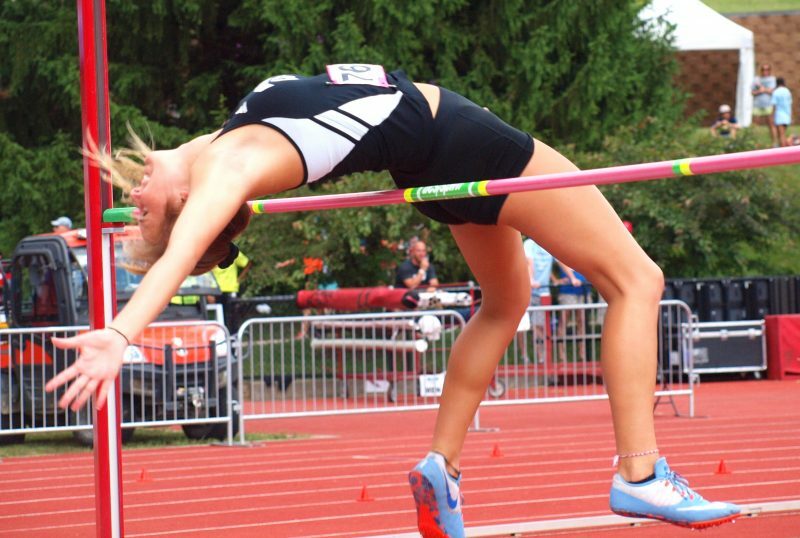 High jump: 1, Shelby Tyler (Noblesville) 5-11. 2, Katie Isenbarger (Zionsville) 5-11. 3, Addie Wanner (South Adams) 5-9. 4, Haylea Crandall (Crawford County) 5-7. 5, Erica Xayarath (Fort Wayne Wayne) 5-6. 6, Faith White (North Miami) 5-6. 7, Marisa Marshall (Pendleton Heights) 5-6. 8, Meleah Leatherman (Central Noble) 5-6. 9, Eris Harris (Hammond Noll) 5-5 … 14, Alexie Day (Warsaw) 5-4 … 15, Caleah Smith (LaPorte) 5-4 … Claudia Marohn (Plymouth) NH. Long jump: 1, Prommyse Hoosier (Warren Central) 20-1 ¼. 2, Addie Wanner (South Adams) 19-0 ½. 3, Lexie Moriarity (East Noble) 18-9 ¾. 4, Tionne Brigham (Evansville Bosse) 18-5. 5, Tierra Sydnor (Hamilton SE) 18-2. 6, Jai-Lyn Norwood (Lawrence Central) 17-11 ½. 7, Christian Haggard (Bowman Academy) 17-8 ¼. 8, Claire Pittman (South Bend Washington) 17-7 ¾. 9, LaTreasure Johnson (Lake Central) 17-6 ¼ … 21, Olivia Elledge (Fairfield) 16-0 ¼. Shot put: 1, Alicia Tiney-Williams (Fort Wayne Northrop) 45-0 ½. 2, Simi Akinrinsola (Ben Davis) 44-1 ¼. 3, Dontrice Barbee (Bloomington North) 43-10. 4, Megan Lambrecht (Bedford North Lawrence) 43-0 ¾. 5, Haley Nichols (Avon) 42-7 ¼. 6, Briyann Robinson (Indianapolis North Central) 42-3 ¼. 7, Madison Ochs (Valparaiso) 41-6 ¾. 8, Ashley Weatherly (West Lafayette) 41-5 ¼. 9, Kayla Truesdell (Jennings County) 40-10 ½ … 19, Alecia Parker (South Bend Adams) 37-9 … 23, Cece Robinson (Plymouth) 36-6. Discus: 1, Sadie Hill (Perry Meridian) 143-5. 2, Hannah Redlin (Rensselaer) 137-9. 3, Maci Heimlich (NorthWhite) 136-11. 4, Haley Nichols (Avon) 133-7. 5, Sarah Himes (Heritage Christian) 131-11. 6, Cassandra Evans (Franklin Central) 131-0. 7, Averi Parker (Lewis Cass) 129-2. 8, Madicon Ochs (Valparaiso) 128-6. 9, Matisen Ingle (Indianapolis North Central) 128-0 … 18, Mia Pulianas (Elkhart Central) 118-2. Pole vault: 1, Kennedy Drish (Hamilton SE) 12-6. 2, Brittney Clark (Valparaiso) 12-0. 3, Maria Siciliano (West Lafayette) 12-0. 4, Kara Deady (Carmel) 11-9. 5, Abby Karnes (Mooresville) 11-9. 6, Jessica Bray (Hamilton SE) 11-6. 7, Lauren Joseph (Plainfield) 11-6. 8, Tie between Taylor Pierce (Tipton) and Megan Young (Indianapolis Ritter) 11-3 … 14, Amanda George (Penn) 10-6 … 15, Kassidy Chudzicki (Mishawaka Marian) 10-6. MENTAL ATTITUDE AWARD: Addie Wanner (South Adams). Adree Beckham competes in the 4 X 800 relay for Warsaw at the State Finals Friday night. Makayla Clampitt races in the 100-meter dash trials at IU.